Art is everywhere you look. It is your creative expression of the human experience. It is whatever your mind can imagine. Our department is here to teach you the skills to produce creations that can be appreciated for their intellect, visual impact, and emotional power. We offer a unique, spiritually led experience in the visual arts. We seek to engage you in the process of perception and practice. We aim to help you develop your distinct visual language. 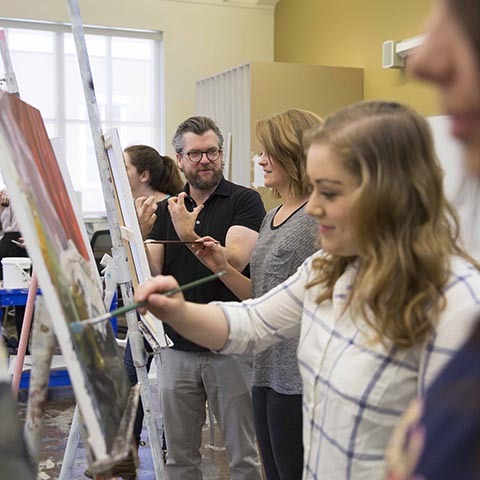 Whether you want to become a studio artist, graphic designer, animator, curator, or an art teacher, we provide a diverse program that encourages you to explore the field that interests you. In addition to being led by a faculty of experienced practicing artists, you will have access to the museums, galleries, design firms, studios, and more that make up Nashville’s vibrant art scene. And we don’t stop there! You can be part of shows, exhibitions, and trips that cross the country and globe. With the Animation program, you can learn everything from character design to top-end 3D animation. You will have the opportunity to be taught by some of the most prominent animators in the country, including Tom Bancroft and John Pomeroy. The program includes an option of two tracks, a B.A. or the more intensive B.F.A. Our Art Therapy program will intertwine your passions for art and healing. You'll develop a strong foundation in all artistic mediums and apply these principles in a robust set of psychology courses and eventually in real-time situations. This program is made up of 51 course hours of art and 18 course hours in psychology. In our Graphic Design program you will learn anything from proper package design and display to web and app development while using state-of-the-art software. All of our faculty have been working in the field for over a decade. The program includes an option of two tracks, a B.A. or the more intensive B.F.A. As a part of our Visual Art Administration program, you’ll learn how to be support the arts as a business person. Our goal is to give students who aren’t necessarily interested in being artists but have a passion for being involved in the arts. This program is made up of 51 course hours of studio art and 18 course hours of business. This program is in partnership with the College of Education to prepare you to teach art at primary and secondary levels. You will be encouraged to take on a studio practice as you are preparing to teach. We are glad you have chosen to visit our site and hear more about our expectations and department. Please be certain to check out all the information on our site, and feel free to email Mia Jaye Thomas at miajaye.thomas@lipscomb.edu or call 615.966.5813 with any other questions you may have. All students wishing to study in our program must submit a portfolio of work for review. These portfolios allow our faculty to evaluate a student's skill level and ability prior to allowing student into the program. Due to the competitive nature of many of our fields, we are strict in our evaluation of these portfolios, so we strongly encourage prospective students, transfer students, and those wishing to change their major to take their portfolio seriously. If you are not applying for a scholarship, below is the necessary criteria for submitting a portfolio. Students wishing to apply for scholarship in the department must also submit an additional portfolio, though they may contain the same works. Information on the necessary material to apply for scholarship is found under the scholarship tab. All incoming students, freshmen and transfers, will not be advised by the Department of Art if the incoming student has not submitted an Entrance Portfolio or Scholarship Portfolio for review by the orientation before your first semester. Digital slides must have a corresponding slide list with the following information: the title of the piece, medium, size of the artwork, and the date of completion. Do not send original art work because portfolio will not be returned. Please submit only digital work in the form of digital file images in either .jpg or .png file formats for images and .mov files for movies. Providing links to a personal YouTube or Vimeo channel for movie files is also acceptable. Questions about submitting a portfolio may be directed to Mia Jaye Thomas via email at mjthomas@lipscomb.edu or by telephone at 615.966.5813. As another school year gets underway, we want to make certain that you have access to the information you will need throughout the semester. If you have questions, please contact our Administrative Assistant, Mia Jaye Thomas at miajaye.thomas@lipscomb.edu. Please be sure to review the Department of Art handbook as well as utilize our on-campus resources such as the Office of Financial Aid and the Office of the Registrar. Individual studio spaces are available for students enrolled in advance level courses. The Student Artist-in-Residence Program offers a significant cash award that provides the opportunity for an upper-level student to spend the summer as a working artist, creating a body of work that culminates in a presentation at the beginning of the following fall semester. In order to renew a current scholarship or apply for a new one, please see our scholarship renewal application process below. The Department of Art grants scholarships on a yearly basis. This is a competitive process, so scholarships are not guaranteed for longer than one year at a time. All scholarships are granted following an application and portfolio review process. It is important that all scholarship applicants carefully read the directions related to their portfolio review and application process. In addition, applicants should familiarize themselves with the requirements for scholarship recipients and FAQ about portfolio submissions. Please note that portfolio guidelines are slightly different for the Animation program. 1. Complete Art Department Scholarship Application. To download, click here. Minimum 10 works/ maximum 20 works. The faculty emphasizes quality over quantity. **Applicants must include all of the above information in a single packet by February 28. The above information is considered incomplete if the packet is not sent in one envelope. Thus, an incomplete packet will receive no consideration as a scholarship contender and will void your right to receive scholarship funds for the year applied. The Art Department claims no responsibility for lost packets, applications, and incomplete materials. It is the applicants’ responsibility that the department receives their packet in full and by the proper date. Notification of awards is mailed as soon as possible. (Tentatively, notification arrives around mid-April). 1. Complete Returning Scholarship Applicant Form. To download, click here. Minimum 10 works/ Maximum 20. The faculty emphasizes quality over quantity. Do not submit original artwork because portfolio will not be returned. Scholarship Application Packets must be received by February 28. Packets may be hand-delivered to the Art department and given to the administrative assistant or placed in the department chair’s box. Please contact the Art Department at extension 5813 if you have further questions. Award recipients will be notified by mid-April. What pieces should I select to go in my portfolio? Your portfolio should consist of 10 to 20 images that best reflect, not only your technical skill, but your unique voice as an artist. Your work should be indicative of what you would like to explore further at Lipscomb. While it is acceptable to select pieces that demonstrate your growth and variety of mediums, this should not be done at the sacrifice of work that may be more recent or of higher quality. Consulting friends, family, and teachers can be helpful when making the decision of what pieces to include in your portfolio, but ultimately, the final decision is best made by you! I don't have access to a studio photographer to take professional photos of my work, what should I do? Don't worry, most students don't! If you have access to a decent camera (or even an iPhone) and a flat surface outside (the ground will work) on a sunny day with few shadows, you can make it work. Just remember these tips: 1) make sure your work is hanging or laying on a flat surface, 2) chose a day when few shadows are being cast on your work, 3) make sure the image is in focus, 4) please be sure to closely crop your image afterwards--there should be nothing else in the shot besides your work! What if I want to explain or give more detail to a piece or my body of work? You will have the opportunity to give more detail or explanation that you feel necessary in a portfolio cover letter. Please do not try to fit this information in your title list. Can I meet with a professor during my visit to campus to go over my portfolio before I submit it? Students should review portfolio requirements online, here. Our faculty will not be able to meet with students individually to review portfolios before submissions. Any specific questions students may have after reviewing requirements should be directed to Mia Jaye Thomas at mjthomas@lipscomb.edu. Who will review my portfolio? Our portfolio review board is made up of full-time faculty that represent each of the degree programs we offer. How will my portfolio be judged? After the deadline, the portfolio review board will gather all submissions for review and vote on their ranking. The top selections will then be moved forward to a vote for scholarship selection. Although the scholarship is open to all students, judges do consider grade level and experience when comparing portfolios, as we expect returning students to have had more practice in technical skill and assembling their portfolios. The Gallery was created in fall 2010 and features a variety of exhibitions each semester. This gallery provides an opportunity to study, exhibit, stimulate appreciation for and advance knowledge of works of art that collectively represent the broadest spectrum of human achievement and artistic interests. Occasional free lectures by nationally and regionally known artists will be held in conjunction with the exhibitions. The Gallery is located in Beaman Library. Special topics travel courses offered each year, create unique travel learning opportunities to New York City, Chicago, Paris, Berlin, etc. Each course is designed to take advantage of the site's specific art venues and experiences. The Visiting Artist Program (VAP) is a vital program that serves to educate and foster a greater understanding and appreciation of contemporary art through critical discourse. This program highlights several artists throughout the academic year from all over the country and brings them to Nashville to interact on a very intimate level with students and the community over a period of 2-3 days. The artists lecture, perform studio visits, hold workshops, and exhibit their work in the gallery. It is a decidedly eclectic program that showcases artists working in all media including sound, video, performance, painting, sculptors, and photographers as well as critics and art writers. Lectures and events with the artists are held 2-3 times each semester. The VAP series is generously sponsored by the Cracker Barrel Foundation of Lebanon, Tennessee.